EXIF data also contains a thumbnail image. This thumbnail image is built by your camera at time of shooting. Some software (including earlier versions of cam2pc) did not update properly this thumbnail when updating the image. The thumbnail may therefore not reflect the current state of the image. cam2pc allows you to update the thumbnail. You may also want to discard the thumbnail which saves some disk space (~10KB for a picture). 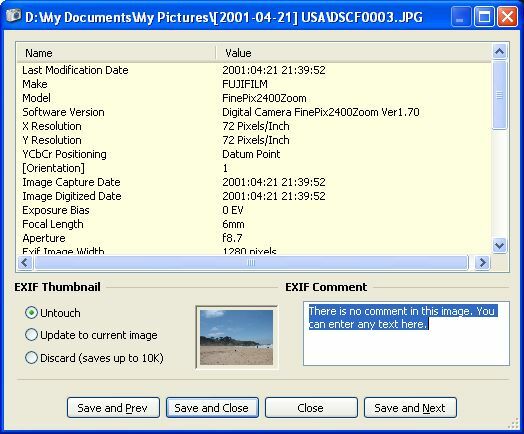 EXIF data also contains a free comment field. cam2pc allows you to edit this comment and enter whatever text you like. This comment is displayed in the details view of the Image Browser. Future versions of cam2pc may use this comment field for Web publishing for instance. The "Prev" and "Next" button allows you to navigate in the images of the folder so if you want to add comments to all the pictures of a folder simply display the EXIF tags for the first image and then use the "Save and Next" button to go to the next image of the folder.